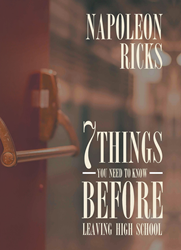 Recent release “7 Things You Need to Know Before Leaving High School” from Page Publishing author Napoleon Ricks is a profound discourse on readiness for what lies ahead in one’s personal growth and development. Napoleon Ricks, a husband, father, author, public speaker, and youth leader with more than twenty years’ worth of experience working with national and international youth, has completed his new book “7 Things You Need to Know Before Leaving High School”: an enlightening dissertation about the foundations laid out during the high school years for building one’s life, in a journey of self-discovery and purpose. Published by New York City-based Page Publishing, Napoleon Ricks’s discerning account is confined not only to high school students, but it extends to all searching individuals as well. This book provides the essential perspective in inspiriting one’s desire to jumpstart a life-changing journey of understanding and achieving success, thus embracing the responsibility for one’s self and others. Readers who wish to experience this prolific work can purchase “7 Things You Need to Know Before Leaving High School” at bookstores everywhere, or online at the Apple iTunes store, Amazon, Google Play, Kobo, or Barnes and Noble.